Dogwood fruit (Shanzhuyu)-ornus officinalis Sieb. et Zucc. Botanical Name: Cornus officinalis Sieb. et Zucc. Part Used & Method for Pharmaceutical Name: The ripe fruit is gathered from October to November. The fruit is baked or boiled, after which the fruit pit is removed. The fruit is then dried in the sun or baked again. Properties & Taste: Sour and slightly warm. Functions: 1. To tonify the liver and kidneys; 2. To astringe the essence; 3. To stop sweating. 1. Deficiency of the liver and kidneys manifested as dizziness, blurred vision, soreness in the lower back, weakness of the legs, seminal emissions and impotence. Dogwood fruit (Shanzhuyu) is used with Prepared rehmannia root (Shudihuang), Dadder seed (Tusizi), Wolfberry fruit (Gouqizi) and Eucommia bark (Duzhong). 2. Spontaneous sweating due to weakness of the body. 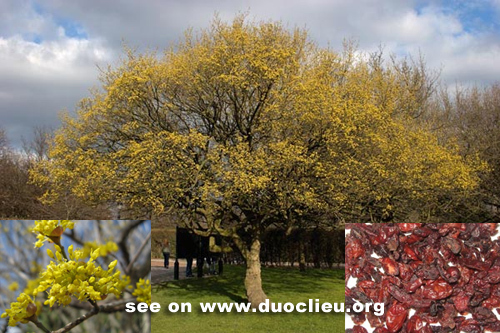 Dogwood fruit (Shanzhuyu) is used with Ginseng (Renshen), Prepared aconite root (Fuzi) and Oyster shell (Muli). Cautions & Contraindications: This herb is contraindicated in cases with damp-heat or dysuria.